Earlier on we mentioned Google's protest against OOXML. What is wrong with the following article however? “Most people still think of Microsoft as the brain behind window-based interfaces (mind the quote at the bottom).”Of course not, but Microsoft vainly chose to confuse people by nicking the OpenOffice brand and putting its proprietary garbage in the same semantic territories, having already pressured OpenOffice to become OpenOffice.org. The mistake is even repeated in the body of this new post, so it’s not just a slip or a typo. It’s confusion, misunderstanding even. And it’s not an isolated incident. Remember that Microsoft not only sees itself as the owner of the literal “windows” (it tried to bully “x windows”), but it also attacked Lindows. Most people still think of Microsoft as the brain behind window-based interfaces (mind the quote at the bottom). We mentioned this only yesterday. As this new article suggests, companies do not trust Microsoft. 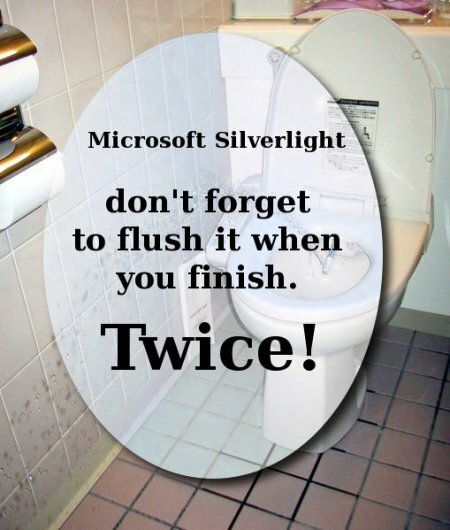 The article’s headline is “Salesforce Says No to Silverlight”. Pay attention to the following new bit of information which shows us just why Salesforce is right. Some other products lose a little oomph, after SP1 installation. My favorite: New York Times Reader. This is the software that Microsoft has touted, like forever, as the showcase native Windows Presentation Foundation application. No longer—or at least not for awhile. While Adobe and Microsoft share similar goals, their development approaches and philosophies differ. For starters, Adobe isn’t a .Net shop. AIR strongly favors existing and popular Web and Web-to-desktop development technologies, such as AJAX, Flash, Flex and HTML. Microsoft leverages .Net Framework, Silverlight, Windows Media Video, Windows Presentation Foundation and XAML. While Microsoft’s development toolset also supports AJAX, HTML and even Flash, the greater emphasis is the company’s own technologies. How do you define ‘commercial open source’? Want to Run Linux on Your Nintendo Wii? Day three of the ridiculous BRM in Geneva [1, 2, 3, 4, 5] will begin in a couple of hours. We carry on bringing back memories of Microsoft's fight for OOXML. This third post among a series looks how Microsoft bullied (yes, quite practically bullied) States CIO and even diplomats in order to stifle the adoption of ODF in the United States. Those of you have followed the developments in the world of document formats probably come across plenty of corruption. The funny OOXML game continues to this date. Massachusetts is no exception and it is probably one among the first places from which ‘funny’ stories arrived. Let’s remind ourselves of the ‘Greatest Hits’ from the State of Massachusetts. Here we have the first state CIO talking about his departure. Almost to a person, to anybody involved or who knows about the ODF issue, they attributed the story to Microsoft, right, wrong or otherwise. Senator Pacheco may be a bully but I do not believe he is disingenious and would stoop to such a tactic. Senator Pacheco and Secretary Galvin’s office remain very heavily influenced by the Microsoft money and its lobbyist machine, as witnessed by their playbook and words, in my opinion. Here is his successor, who held a similar position and stance that defends the interests of the citizens, not the cashflow of a convicted monopoly abuser. To Microsoft, his departure was a sweet victory. Two CIOs then had their influence inherited by a Microsoft lobbyist. Microsoft essentially took control of the state. That person is Brian Burke, the Microsoft Regional Director for Public Affairs, and if that surprises you, it surprises me as well, given the degree of acrimonious debate and disinformation witnessed in Massachusetts over the last 15 months involving the Information Technology Division’s transition to ODF. If you think that’s bad, check out what they did in Florida. It was just a bit of text advocating open data formats that was slipped into a Florida State Senate bill at the last minute with no fanfare, but within 24 hours three Microsoft-paid lobbyists, all wearing black suits, were pressuring members of the Senate Committee on Governmental Operations (COGO) to remove the words they didn’t like from Senate bill 1974. There has been a lot of discussion recently due to the case which revolves around business methods. There is hope is that a responsible reform addressing the issue will knock down software patents as well. Have a look at this new article from BusinessWeek. Forbes Magazine, as obedient as ever to its business roots and motives, presents the view which favours monetisation at the expense of innovation. Successful free enterprise requires an effective system of property ownership rights. Economists like Hernando de Soto believe that such rights are the underpinning of capitalism and explain how for decades America’s strong patent system has fostered economic growth and innovation in the face of intensifying international competition. Although many factory jobs have moved overseas, knowledge workers have enjoyed improved living standards in the United States. For another more visual perspective (a video), there is this recent one. The “knowledge worker” monopoly is spurring great debate. When it crosses over to software, this means that people in poorer nations are hardly allow to program (or distribute their programs). What’s next? Will people not be permitted to practice mathematics, turning it into a luxury of only the affluent? There is this excellent new article from Wired Magazine, which analyses some of the effects of modernisation (and digitisation). Over the past decade, however, a different sort of free has emerged. The new model is based not on cross-subsidies — the shifting of costs from one product to another — but on the fact that the cost of products themselves is falling fast. When all else fails, litigate? Acacia Research Corporation ACTG announced today that its Mobile Traffic Systems Corporation subsidiary has settled patent litigation against Cobra Electronics Corporation that was pending in the United States District Court for the Northern District of Alabama. The licensed technology generally relates to systems and methods for transmitting, receiving and displaying traffic information on portable handheld and mobile devices. This technology is used to identify traffic congestion and can be used with in-vehicle navigation displays and portable handheld units such as cell phones and PDAs. There is a bunch of reports out there about Linus Torvalds cautiously welcoming Microsoft’s Taxoperability Program, but there is the possibility that he misses a broader picture. To repeat a response to Asay from yesterday, consider the following comment from Michael Tiemann, President of the Open Source Initiative (OSI). In my opinion, anything that Microsoft does that falls short of the published open source minimums is…sub-minimal. Torvalds is happy because his standards are lower–he cares more about himself than his community. But other people have higher standards–we also care about the community at least as much as we care for ourselves. The words here are a little strong and Tiemann, who is most notably behind “Open Source”, seems to be embracing a Richard Stallman-like (GNU/FSF) stance, caring to ensure that software remains free and secure from software patents. "To benefit from this promise, You must be a natural or legal person participating in the creation of software code for an open source project. An "open source project" is a software development project the resulting source code of which is freely distributed, modified, or copied pursuant to an open source license and is not commercially distributed by its participants. If You engage in the commercial distribution or importation of software derived from an open source project or if You make or use such software outside the scope of creating such software code, You do not benefit from this promise for such distribution or for these other activities." 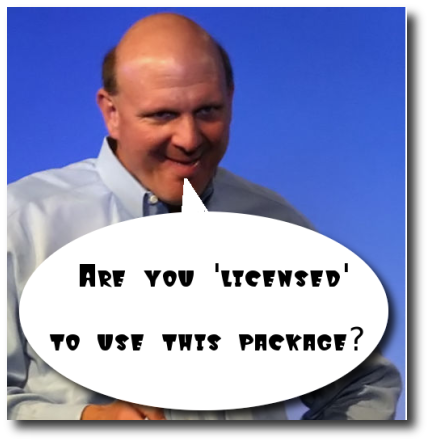 here is a lot of discussion around the new Microsoft premise to offer freely documentation about its protocols and interfaces, and to not sue developers who use it to create code for non-commercial goals, even if they violate Microsoft patents. Some people think that this is done to avoid further pressure from the European Commission. It could be so – but there could be also a different rationale for it. I would. Fair is fair… If only it wasn’t for one small detail: this way, they destroy the FOSS essence. Every FOSS license gives you the right to use and distribute the software in any way you like, commercial or not. If you are limited to non-commercial distribution only, this is not freedom anymore. And this is going to damage the positions of FOSS not only among the freedom pundits, but also (and maybe even more) among the ordinary users. That is – to marginalize FOSS.